Autumn 1803, and Britain remains under the threat of invasion. HMS Prometheus is needed to reinforce Nelson's squadron blockading the French off Toulon, but a major action has left her severely damaged and the British Fleet outnumbered. 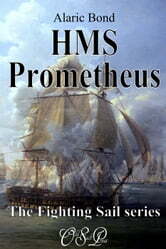 Prometheus must be brought back to fighting order without delay, and the work proves more than a simple refit. Barbary pirates, shore batteries and the powerful French Navy are conventional foes, although the men of Prometheus encounter equally dangerous enemies within their own ranks. A story that combines vivid action with sensitive character portrayal. Number eight in the Fighting Sail series.